The day after Thanksgiving used to be for stuffing yourself with leftover turkey. Now, it’s for stuffing your cart full of bargain-priced Christmas gifts. There’s no doubt that Black Friday, an American shopping institution, has become as integral a part of Thanksgiving as the cranberry sauce. If you’re familiar with DISC, you know that most aspects of your behavior are connected to your personality type. So is it possible that the way you approach Black Friday is also connected to your personality? Absolutely! 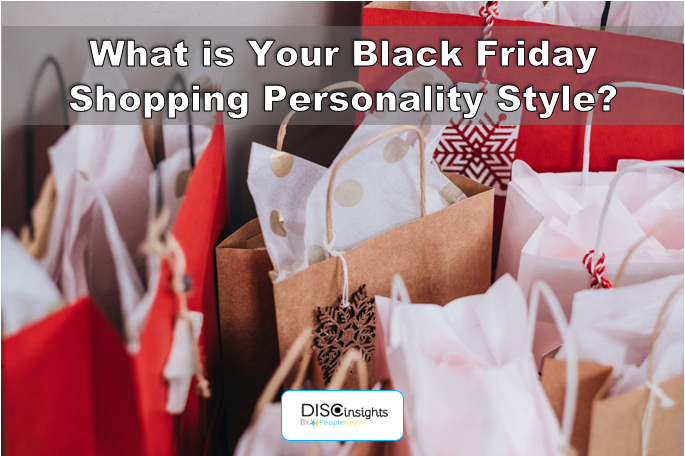 Let’s take a look at the four primary DISC Black Friday shopping personality types. For people with a D personality style, Black Friday is an event. People with a D style personality are naturally competitive. Black Friday shoppers with personality type D are committed to ‘winning’ at Black Friday. They are first in line, scoring all of the best deals before anyone else can get their hands on them. They don’t have a lot of patience for crowds but won’t let a little temporary discomfort prevent them from being the best Black Friday shopper that ever was. 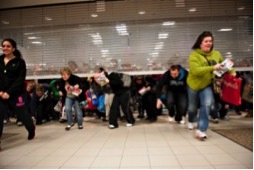 They know the key to Black Friday: to be faster and more determined than the person next to you! For people with an I personality style, Black Friday is fun. 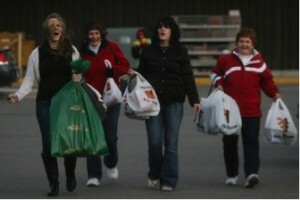 People with personality style I get excited about Black Friday. But for them, it’s not necessarily about the bargains. Sure, there might be one splurge-worthy item they have their eye on, but they won’t fight anyone for it. For people with an I personality type, the biggest draw of Black Friday is the people watching. I personality types are energized by crowds, and they love being a part of the frenetic, chaotic energy of Black Friday. They’re very likely to go Black Friday shopping with a few friends, laughing and chatting the whole time. They’re not stressed out about buying things from a list (lets’ face it, lists and I personality styles aren’t terribly compatible), so they go Black Friday shopping just to soak it all in: the tag-team shoppers with walkie-talkies, the manic behavior of the people who have been at the front of the line for hours, the squabbling couples. Pass the popcorn – It’s like spending the day at a human zoo. For people with an S personality style, Black Friday is a ritual. People with an S personality type are all about family and tradition. People with an S personality that have made Black Friday a part of their post-Thanksgiving ritual wouldn’t miss it for the world. In fact, they use the same Black Friday game plan that they run every year—They always leave at roughly the same time, hitting the same group of favorite stores. S-style Black Friday shoppers don’t understand all the fuss about Black Friday destroying the “togetherness” of Thanksgiving, because they like to bring their family and friends with them when they go Black Friday shopping. Even when they go alone, they day is about finding gifts for their family that will really knock their socks off. For S-style shoppers, Black Friday is a family event. For people with a C personality style, Black Friday is a puzzle to be solved. By the time Thanksgiving has rolled around, a big percentage of C’s have already finished their Christmas shopping. That means that the bulk of the Black Friday shopping for C personality types involves looking for just ONE special item they’re hoping to score, and they’ve done hours of research to find the best deal out there. Black Friday shoppers with a C personality type have a plan of attack for Black Friday that involves a list of where to go and when to get there. They’ve packed a backpack full of the essentials to get them through the day: water, store map, power bar. They’ve downloaded a special Black Friday app on their phone that will give them real-time updates on the availability and location of special deals. They have limited patience for lingering or browsing. There’s a plan, their focus is clear, and their strategy is brilliantly efficient. For more information about your shopping style during the holidays, check out the Holiday Shopping: For Each Personality Style blog!